Cantilever Park is the ground of my hometown football club Warrington Town, where I am now a Vice President. 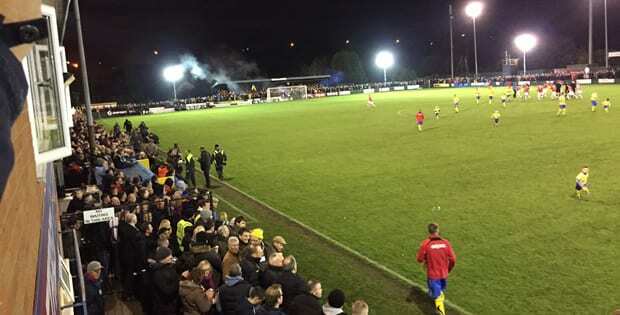 The club has played at the 2,500 capacity ground since 1965, and it was the venue for the finest hour in the club’s history – the FA Cup first round win over League Two side in Exeter in November 2014. It sits on the northern bank on the Manchester Ship Canal in Latchford, and takes its name from the Cantilever Bridge, a high-level road bridge that goes over the canal. The ground is a lovely little non-league ground. There is a main all-seater stand which the canal runs behind, and then a covered terrace behind one of the goals. There is also another covered terrace on the opposite side to the all-seated stand – which used to have seats, but they were taken out to accommodate extra spectators ahead of the FA Cup tie. The club house holds the changing rooms, an office and a hospitality lounge, while there is also a social club attached to the ground. Down that side there is also a club shop and a small refreshments hut. You can stand along the pitch at any point, including next to the dugouts, which is an experience, particularly with Shaun Reid as Warrington manager. Unfortunately, the ground’s location isn’t great. The ground is easily missed as you go round the corner of Loushers Lane. It’s a couple of miles from the town’s bus and rail stations, although you can get a bus from the town centre to the ground. You get to the ground through a small car park, and there are then three turnstiles tucked away to the right hand corner of the ground. In my first few years following Warrington, I used to sit in the main seated stand across the other side of the ground. It’s a fairly good view from there, although you tend to get a good view at all non league grounds, given the proximity to the pitch. Speaking of the pitch, I can’t talk about Cantilever Park without mentioning it. It’s a bit bobbly at times, and a bit uneven in one corner. However, the groundsman does a fantastic job. It’s just a consequence of the ground’s location. The ground is of course my most local football ground. The atmosphere is as good as it can be with 250 spectators on home games, especially in the shed end. For the sold out FA Cup tie, it was electric. A night I will never forget, and probably a night that won’t be repeated for a very long time.